For many adults, the dentist can be a scary experience, so we understand that you may have some reservations about bringing your baby to the dentist. We’re here to help! It probably sounds like a lot to tackle, but if you follow these simple guidelines, you’ll have no problem transitioning your child into a good oral health routine. 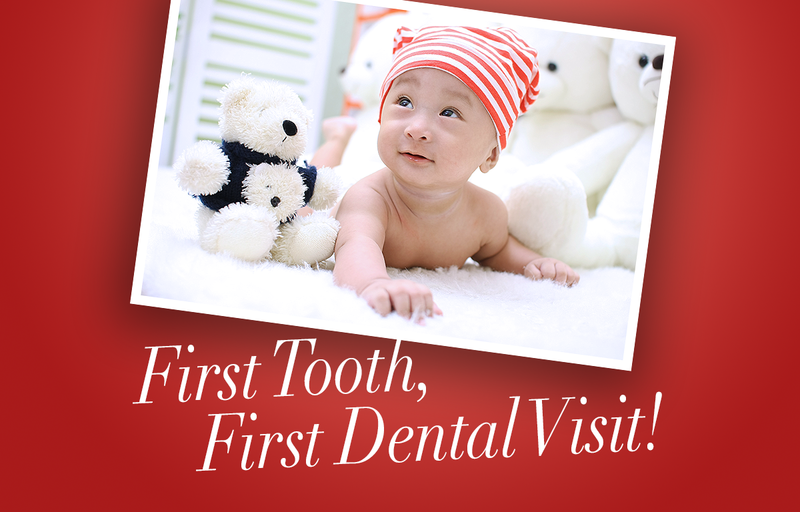 Your child should be making their first dental visit before their first birthday. The general rule that most dentists follow is that the child should start seeing a dentist regularly six months after the eruption of the first tooth. When your child’s first tooth comes in, make an appointment with the dentist to discuss what their first visit will be like, so that you can do your best explain to the child beforehand what will happen. We all know that our kid can have those days; the ones filled with tantrums, screaming, and general grumpiness. Plan ahead for that, and be willing to reschedule if you think it may not be a great day for baby’s first visit. Alternatively, if your child is compliant, then be ready to go through the process with them. It may be easiest to schedule an appointment in the morning when your child is most alert. If your child is under 36 months, for their first visit you will sit in the dental chair and the child will sit in your lap, as it will make the trip easier for them. If your child feels comfortable doing the exam, expect it to last between 15 to 30 minutes. The dentist will do a thorough examination of the teeth, gums, jaw, and bite as well as do a gentle cleaning, conduct x- rays, and show them how to clean properly at home. It may be a little awkward and uncomfortable for baby at first, so be sure to be patient with them and ready to provide any reassurance the child may need. The dentist wants nothing more than to make your child’s first visit as easy and comfortable as possible, and so do you! With proper planning and cooperation, your child will be well on their way to a lifetime of good oral health.